When you're in the market for a luxury crossover, it won't take long to realize there is a lot out there to choose from. So, it's important to know as much as possible, not only about everything there is to be had but also how the luxury rides differ from one another. The 2019 Q7 is not only striking in appearance and comfort, but it features a lot of things you might prefer over its competition in the BMW X5. First, the basics of the Audi Q7, which make it anything but basic. The 2019 Audi Q7 offers 3 trims to choose from; Premium, Premium Plus, and Prestige. The mid-size crossover features sharp styling across every inch of its long, wagon-like body. At the front of the 2019 Audi Q7 is a fascia boasting a large hexagonal grille flanked by pronounced headlights. On the base Premium trim, the interior includes 3 rows of seating and a power-folding third row. With seating for up to 7, the Audi Q7 has not only plenty of space, but a number of amenities to make road trips of all distances trips worth remembering. By comparison, the standard BMW X5 maxes out with just 5 people. In the 2019 Audi Q7, you will also enjoy a panoramic power sunroof with a power sunshade. So, whether you're just headed into the office each morning, loading the family up for a long journey, or taking a camping trip in the woods, the 2019 Audi Q7 has got you covered. Like most people, the price is always a consideration. If that's the case with you, then the 2019 Audi Q7 takes an early lead over the BMW X5. The base trim of the Audi Q7 starts at an MSRP of just $53,550, while the price tag for the base BMW X5 xDrive40i rings in at over $60,000. In the following sections, look for more ways in which the Audi Q7 could make a marked difference in your decision process. 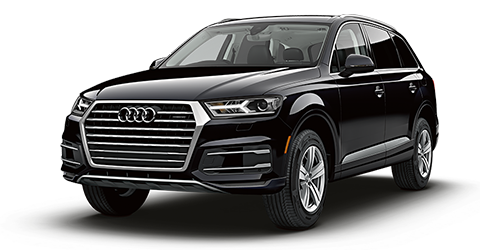 For a test drive or to learn more about the 2019 Audi Q7, we encourage you to visit Audi Oklahoma City, your Oklahoma City car dealership. When considering a luxury SUV of the 2019 Audi Q7's caliber, you're considering the whole package. Looks certainly go a long way and comfort is a big plus, but muscle for outings of all sizes and scopes is also significant. In a 2019 Audi Q7, beginning at even the base Premium level, power is at a premium. The base powertrain on the 2019 Audi Q7 is a turbocharged TFSI® ultra® 2.0-liter 4-cylinder engine that comes complete with 248 horsepower and 273 lb-ft of torque. An 8-speed Tiptronic automatic transmission pushes power to the legendary quattro® all-wheel drive system. The base Premium Audi Q7 rides on 17-inch alloy wheels, with 18 inches available. If you're looking for more power, the Audi Q7 offers an available 3.0L TFSI 6-cylinder engine, which pumps out 329 horsepower and 325 lb-ft of torque. While the BMW Q5 features a standard 3.0-liter 6-cylinder engine, it still has a higher starting MSRP than the rival Audi Premium 3.0T. That's especially impressive considering the Audi Q7 holds up to 7 people, as opposed to just 5 in the BMW X5. When you get inside the comfortable, spacious 2019 Audi Q7, you may often want to just take a deep breath, decompress, and tune the outside world out. We understand that. However, in this era, at least having the opportunity to stay connected is an option that comforts many drivers. In the 2019 Audi Q7, premium technology allows you to do everything from tuning the outside world out with some of your favorite playlists on a luxury audio system, staying connected to the outside world with the ability to make/take hands-free calls, or utilizing the internet through your smartphone. In short, technology gives you choices. The base level of the 2019 Audi Q7 gets the interior experience going with a push-button start of the engine. From there, enjoy Bluetooth® wireless streaming and hands-free calls. Stay connected and fully-charged at all times via dual USB ports and an auxiliary port. Apple CarPlay™, Android Auto™, and 4G LTE wireless internet are all available features even at the base level. Standard on the base Premium trim of the 2019 Audi Q7 is MMI® radio plus, an infotainment system with a 7-inch color display screen. The Premium Plus trim ups that in size to 8.3 inches. No matter how you wish to enjoy your next driving experience, count on the technology features of the 2019 Audi Q7 to give you exactly what you need and wish for. When it comes to choosing the right vehicle for you, safety measures trump all else. Without feeling safe in your vehicle, there is a lack of both comfort and confidence. While the BMW X5 certainly comes with a lot of respectable safety features, there are a number of areas in which the 2019 Audi Q7 does a better job of protecting you and your passengers. To help keep you and your passengers better protected, the front and middle-seat shoulder belts of the 2019 Audi Q7 feature pretensioners, which tighten the seatbelts to ward off potentially dangerous slack in the event of a collision. The BMW X5 does not offer pretensioners for its middle seat belts. Also, it's no secret that a better-fitting seat belt can not only help decrease the extent of injury in an accident, but better-fitting ones are also more likely to be worn. The 2019 Audi Q7's front seat shoulder belts can adjust to accommodate drivers and passengers of different heights. The 2019 BMW X5 doesn't offer height-adjustable seat belts. In the event of a crash, a secondary collision is not unlikely and could result in further damage or injury. The 2019 Audi Q7 comes standard with Secondary Collision Brake Assist, which automatically applies the brakes after an initial collision. This can reduce the chances of collateral damage. The BMW X5 does not come with a post-collision braking system. Another way in which the Audi Q7 can better protect you in the unlikely event of a collision is with its available backup collision prevention system, which utilizes rear sensors to automatically put on the brakes and help prevent a rear collision. 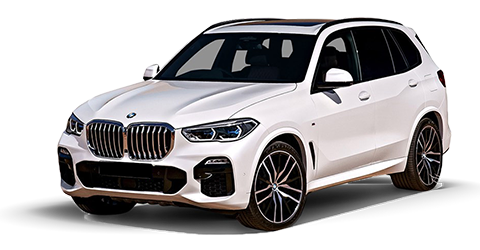 The 2019 BMW X5 does not offer such a feature. To get better peace of mind and learn more about all the safety features standard or available in the 2019 Audi Q7, visit Audi Oklahoma City today. At Audi Oklahoma City, we know there are a lot of quality crossover SUVs out there. While other SUVs offer many features you may be interested in, it's always nice to compare the competition to see which is the best overall fit for you. To further investigate the 2019 Audi Q7, visit the preferred car dealership in Oklahoma City. If the 2019 Audi Q7 isn't exactly what you're after, we still suggest visiting Audi Oklahoma City in person. You'll be amazed by our extensive inventory of other new vehicles, as well as a massive selection of certified pre-owned and used vehicles. If you are among the many who adhere to a budget, we've got you covered. Our finance center can – and has – worked with shoppers on all kinds of budgets. We can talk with you about leasing, loan, and financing options. About the only thing we don't bring to the table is stress. You will meet with a friendly professional devoted to a pressure-free visit. Already own a vehicle but just need to give it a little attention? The service department at Audi Oklahoma City is renowned for jobs of all sizes, from simple oil changes to more involved engine or body repair. Don't trust just anyone with your shopping experience or to work on your beloved car, truck or SUV. At Audi Oklahoma City, we treat you with the utmost respect and courtesy. After all, word of mouth is the greatest form of advertising. And, that is precisely how we've earned the reputation of being the Oklahoma City car dealership more drivers prefer.